Yelling is a natural response when your kids are rude, not listening, engaging in irresponsible behavior or treating you poorly—or in any other situation that triggers your emotions. Even though you know it would be better if you could stay calm, it’s hard to always do that emotionally. Related: How to parent calmly, even when your kids are pushing your buttons. 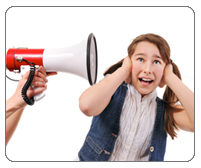 Related: How to stop yelling at your kids. Related: How to start parenting with calm today.